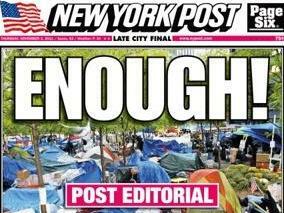 New York City’s Mayor Michael Bloomberg “finally decided to wipe Zuccotti Park clean after learning about a rancid outbreak of scabies, lice and lung ailments among protesters,” reports the New York Post. Meanwhile, a nurses union bused in 1,000 members to Occupy DC from as far away as California and Florida — prompting pundits to speculate whether the health care workers, many from Veterans Administration hospitals, could have been better deployed to prevent New York from having to hose down Manhattan’s park protest site. Another factor was protesters’ plans to storm the New York Stock Exchange, a massive action that had been planned for this week, multiple sources told the Post. An administration source told a reporter that Bloomberg gave the go-ahead to roust the protesters and ban further overnight camping because of “an accumulation of things” — including the growing filthiness of the site due to a lack of sanitation as well as concerns that the park could became a deathtrap since protesters were planning to build wooden structures to prepare for winter. Former Mayor Rudy Giuliani has been critical of Bloomberg, saying he would never have tolerated protesters sleeping in the park. Bloomberg was also chaffing after reports “that Oakland Mayor Jean Quan was being lauded for acting against the Occupy Oakland movement and that Denver Mayor Michael Hancock was being praised for taking a hard line,” reported the Post. A few days ago, 11 U.S. mayors participated in a conference call on how to deal with the protests days before several cities cracked down, a spokesman said.